This short comedy from Georges Méliès demonstrates his developing ability to use the camera to create illusionary settings. In this case, a ship in bad weather is recreated through set design and use of the camera. We see a set made to suggest the upper deck of a small craft. It rocks back and forth, and the passengers tumble about. Some retreat to the interior, a woman to the left side of the stage gets sick into a basket or bowl, and the captain steadfastly clings to the railing as he rides it out. One man in center stage is still trying to get the steward to bring drinks and a meal. His table topples over before the food arrives, but he rights it and the steward unsteadily delivers the order. The man begins to eat and drink when an especially strong wave bowls him into the table. Finally, everyone on deck decides it’s time to go below. The big question, that I was unable to answer for certain after repeated viewings, is: Did Méliès rock the set back and forth or simply the camera? It would be more innovative and clever to realize that you could achieve the same effect by rocking the camera, but Wikipedia simply says he used “a special articulated platform,” which sounds more like the set was on a platform, but I’m not certain. If you pay attention, you’ll see that the table falling over, the motions of the open door, etc appear to be managed by the actors themselves – nothing seems to fall over by itself, so it could be the camera, but I can’t be sure without more research. The “First Wizard of Cinema” DVD describes this as “actuality/reenactment,” but to my mind it is neither. It is clearly a scene created in a false environment for entertainment purposes, which is why I’m calling it a comedy. It is conceivable that it was intended to reenact a recent news-worthy storm, but without the original narration, we’ll never know. The fellow who grabs our attention is again played by Méliès himself, once again showing off his great screen presence: his checked suit is padded to make him look fatter and he wears a deerstalker cap, apparently not an homage to Sherlock Holmes but perhaps intended to make him look more English. 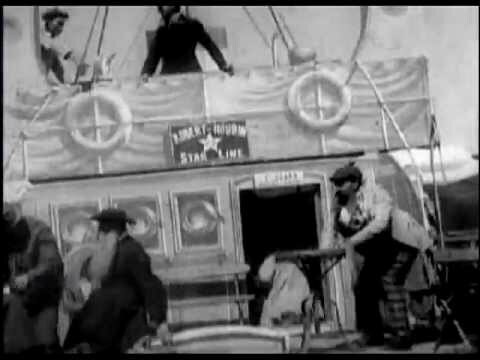 Note that the ship has a prominent label reading “Robert-Houdin/Star Lines.” Star Films was the name of the company Méliès created to distribute his movies, and the Robert-Houdin was the theater in Paris where he exhibited them. You’re right – some of the motion of the table, door, etc. seems to be due to the actors, not the motion of the ship. I had to wince while viewing this, but I also had to laugh. I had the same experience several year ago, crossing from Calais to Dover on very choppy seas. I could certainly identify with this film! Haha! It’s funny, in that sense, that Melies is remembered for “fantasy,” when he was also the first to create such a realistic effect.